Jim Wiedemer is a real estate lawyer, teacher and writer. “Yes, but which one is your favorite?” I ask. He can’t decide; he likes them all. Jim is a well-rounded individual. He was the second teacher hired by Center for Advanced Legal Studies in 1987, four months after the Center opened its doors. He has taught most legal classes, but these days, as he does in his practice and his writing, he focuses on real estate law. If you dread the mere thought of “public speaking,” you are among millions of individuals who feel the same way. Giving a speech ranks above snakes, death and financial ruin in the hierarchy of human fears. Furthermore, it doesn’t take a large audience to trigger panic. Just presenting material out loud to one person can set your heart pounding and your mouth feeling as dry as the Gobi Desert. 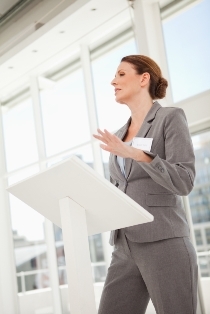 You may think that, as a paralegal, you will never have to give a speech. But if you define a speech as any information you prepare and deliver verbally to another person, or a group, then you could find yourself becoming a “speaker” fairly often. Gretchen Havens is a faculty member who teaches Introduction to Speech at Center for Advanced Legal Studies. How many speeches do you think you’ll give during your life? “Hopefully,” you say, “none!” So what purpose can a Speech course serve for a paralegal in the real world? If Speech were only about giving speeches, you would have good reason to doubt its usefulness. But a Speech course also helps develop a number of skills that come into play once you are working. As you know, few occupations demand more of you than the legal profession when it comes to thinking on your feet and communicating clearly. Interestingly, those are just the skills you need to deliver a good speech. Looking at the comparison more closely, the process of preparing a speech requires the same analytical and organizational abilities required of a paralegal. On the job, you may use those abilities in writing deposition or document summaries, case status memoranda, or something as simple as a transmittal letter. In Speech class, analyzing and organizing data are used to develop an outline of what you’re going to say, the first step in putting a speech together. In either case, incidentally, you usually don’t have much time to get the work done! After outlining a speech comes the actual writing. Because strong written communication skills are a universal requirement for a paralegal, speech writing proves quite valuable. During the Speech course at Center for Advanced Legal Studies, AAS Degree students write and deliver one talk a week. This provides an extended opportunity to increase your proficiency in sentence structure, grammar, usage and spelling. In general, delivering speeches just naturally develops your capacity to formulate and transmit ideas more clearly. Why? Because, as authors know, there is nothing like speaking your own words out loud to give you a valid perspective on the quality of your writing. Another major component of creating a speech is research, a task you may perform in your paralegal career. Legal research includes identifying appropriate laws, judicial decisions, legal articles, and other materials that are relevant to your assigned cases.Besides locating the data, you must sort through it to pinpoint the exact material you need. Preparing speeches serves as good practice, since even a three-to-five- minute talk can entail tracking down and summarizing information from a number of sources. Of course, any discussion about Speech has to address the fear factor, since it is a matter of record that most people would rather have a root canal than speak in front of others. A wise speech teacher addresses this issue right away, getting you to write down your fears and leading a class discussion on the topic. S/he will also teach you a variety of tools for reducing your anxiety both before and during a presentation. But it is often the repetition of giving speeches in class, week by week, that helps manage your anxiety the most. Stepping out of your comfort zone in this manner reaps big benefits, specifically a boost to your self-confidence, self-worth and assertiveness. You begin to enjoy these rewards on the spot with the peer support that emerges in a Speech class. The positive feedback exchanged during critique sessions raises individual morale and promotes team spirit. Teamwork is also cultivated with exercises in which students break into groups, then block out and write speeches together. Exposure to this kind of brainstorming helps prepare you for the future possibility of workingin teams with one or more lawyers, paralegals, or legal secretaries. You can see that, even if you never give another speech again in your life, you can carry over a good deal of relevant experience from a Speech course to a paralegal post. Reassuringly, these six weeks of instruction take place in a supportive environment where you learn from your missteps and expand on your strengths while your classmates root you on. Once you settle into the workplace, you may look back at this experience as one of the most helpful building blocks in your paralegal training.